This shrimp salsa recipe is one of my favorites. I love all the fresh, healthy ingredients, especially the flavor. The flavor keeps bringing me back and I think it will for you too. In creating this dish the first thing I wanted to do was create a salsa recipe that was special. So I decided to do it up with some baby shrimp. If you can’t find baby shrimp, buy the larger shrimp and chop them into small pieces. Remember, fresh salsas are always best served the same day you make them. 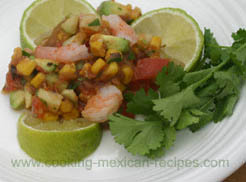 Serve this shrimp salsa in a bowl that is placed in another bowl filled with ice to keep it chilled. 2/3 cup chipotle roasted salsa, or more to taste. Some like it hot! Drain the water from the can of corn. Preheat the olive oil in a fry pan over medium high heat. Add the corn and saute until corn looks roasted with brown spots. About 3 to 5 minutes. Remove from heat and cool. Chop the tomato, bell pepper, garlic, onion, cucumber, and cilantro leaves and add to a bowl. Add the chipotle salsa, shrimp, lime juice and salt and mix well. Add the corn when cool and the avocado. Mix gently. Now is the time to taste it to see if you need to add more salt or chipotle salsa. Refrigerate 1 hour before serving. Makes approximately 3 cups. Shrimp salsa can be served with quesadillas, tacos, fajitas or just by itself with chips. This is the perfect Mexican appetizer. It goes great with Mexican food or even on top of a green salad –very versatile. I know you will enjoy this south-of-the border delight.